This happened in 1937, Josephine said; she was 11 years old and didn’t know the woman’s name until much later, nor did she say anything publicly about it until she was 20 years old, working on Saipan as an assistant to Navy dentist Dr. Casimir Sheft. 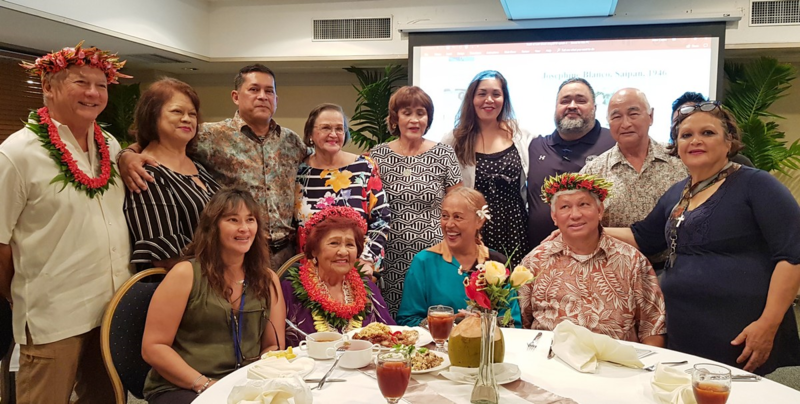 Josephine Blanco Akiyama (second from left, seated) poses with her Blanco family at the dinner hosted by the Amelia Earhart Memorial Monument Committee, led by Rep. Donald Barcinas and Marie S.C. Castro, at Fiesta Resort & Spa on Tuesday evening. Photo by Lori Lyn C. Lirio, Marianas Variety. In the summer of 1937 Josephine was riding her bicycle toward Tanapag Harbor. She was taking her Japanese brother-in-law, J.Y. Mastsumoto, his lunch and was hurrying along because it was nearly 12 noon. Josephine has a special pass to the Japanese military area near the harbor. Not even Japanese civilians were admitted to the area unless they carried the proper credentials. The young girl rode up to gate, stopped her bicycle, and presented her pass. The guard allowed her into the restricted area. On the way to meet her brother-in-law, Josephine heard an airplane flying overhead. She looked up and a saw a silver two-engine plane. The plane seemed to be in trouble, for it came down low, headed out into the harbor, and belly-landed on the water. The plane crash-landed in the harbor. She and her brother-in-law joined the people who gathered to watch. She saw the American woman standing next to a tall man wearing a short-sleeved sport shirt, and was surprised because the woman was not dressed as a woman usually dressed. Instead of a dress, the American woman wore a man’s shirt and trousers; and instead of long hair, she wore her hair cut short, like a man. The faces of the man and woman were white and drawn, as if they were sick. Lirio added that Rep. Donald Barcinas, president of the memorial committee, “said their plan to build an Amelia Earhart monument on island has the support of the Marianas Visitor Authority, the Department of Public Lands, the Historic Preservation Office and the Department of Community and Cultural Affairs.” This sounds encouraging, but with the exception of a recent significant donation by a local, independent couple, the vast majority of contributions to the memorial has come from U.S. contributors, and remains a relative pittance. The headline story of the May 27, 1960 edition of the San Mateo Times was the first of several written by reporter Linwood Day based on Josephine Blanco Akiyama’s eyewitness account (photo inset above right) that set the stage for Fred Goerner’s first visit to Saipan in mid-June 1960 and led Goerner’s 1966 bestseller, The Search for Amelia Earhart. 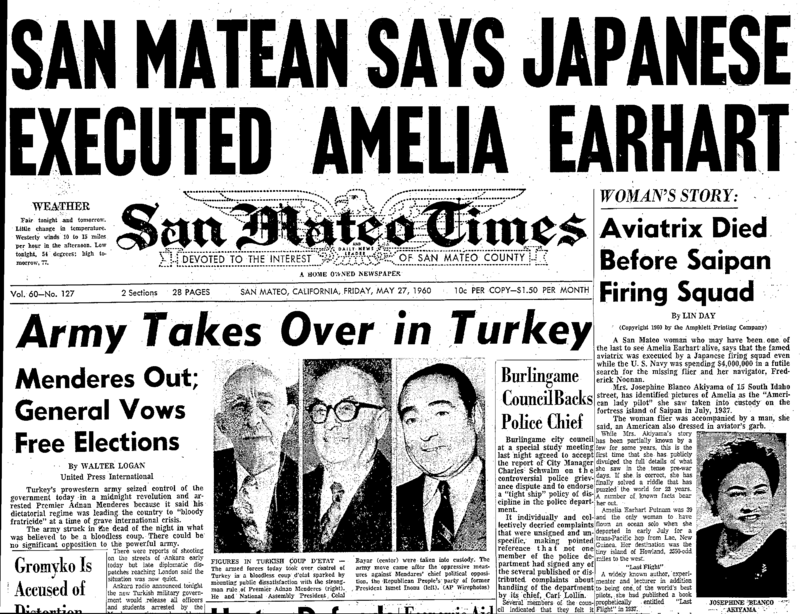 Day worked closely by phone with Goerner, and on July 1, 1960, the Earhart frenzy reached its peak, with the Times announcing “Amelia Earhart Mystery Is Solved” in a 100-point banner headline. None of the major newspapers in America ever touched this story, though some of the smaller papers in flyover country did run it. To read the Marianas Variety story, please click here. 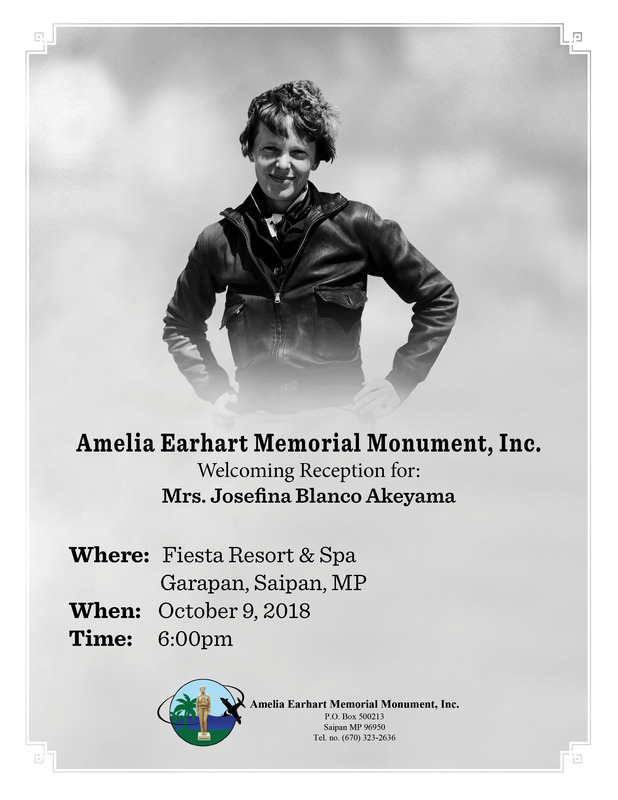 Meanwhile, Saipan’s other newspaper, the Saipan Tribune, whose coverage of the monument issue has been tepid since the proposal was announced last February — see “$150K requested for Amelia Earhart statue” and “Group behind Earhart memorial seeks assistance from Rotary Club” — showed up, but one can only wonder why they bothered. A moving photo of Josephine with two of her nephews at the dinner is nice, but otherwise it’s hard to imagine a more halfhearted effort than the Tribune presents in “I saw Amelia Earhart,” by reporter Erwin Encinares. This mediocrity wasn’t even on the Tribune’s front page, but was buried somewhere back in the paper. I had to actually search for it in the online edition because it wasn’t even listed on the first page of the local news items, which themselves were buried. “Two persons reportedly saw on two separate occasions the lost aviation pioneer Amelia Earhart on Saipan, the first female aviator to fly solo across the Atlantic Ocean,” Encinares wrote in his uninspired lead, which went downhill from there. In addition to turning off virtually anyone who might have been remotely interested, Encinares got Josephine’s current age, 92, wrong (93), as well as her age when she saw Amelia, 11, not 12 as he wrote. 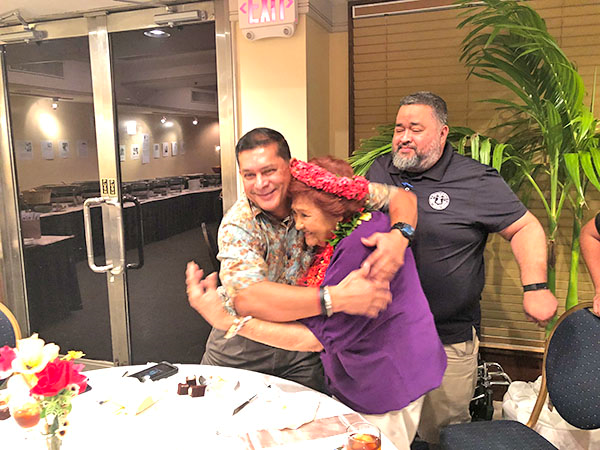 The Saipan Tribune should have opted out of this event rather than undermining it with this poorly written story that, in fact, signaled its readers that the occasion of the return of the most important of the Saipan eyewitness is all but meaningless to them. Moreover, the story contained nothing about the planned Earhart memorial monument. To read the Saipan Tribune story, which has garnered no “Likes” and one comment — a correction of another factual error in the story — since its publication on Oct. 11, please click here. TV is always more effective in our video-centric media culture, and the Saipan KSPN2 News (Saipan’s Destination Channel) story was far better than the Saipan Tribune’s lame effort, though its report on the Oct. 9 event didn’t air until Oct. 15. The three-minute, 40-second segment featured Ashley McDowell interviewing Josephine at the dinner, with cutaways to file footage of Amelia and still shots of Josephine and Dr. Casimir Sheft. McDowell’s visit to Tanapag Harbor, where Josephine saw the fliers in 1937, was a nice touch. Otherwise, McDowell’s decision to display, or more accurately, flash the July 1, 1960 front page of the San Mateo Times, with its 100-point banner headline proclaiming, “Amelia Earhart Mystery is Solved,” which readers have seen many times on this blog, highlighted a mostly flat, disappointing report, much too low-key and uninspired than this rare occasion demanded. Having the famous Josephine Blanco Akiyama live and lucid at 92 was a miracle in itself, but you’d never know it by watching this video. The segment ended with McDowell voicing no real conclusion or telling point, and again, nothing was said about the proposed Amelia Earhart Memorial Monument. On a scale of 1 to 10, this was a 5 at best, and it likely didn’t change any minds among the uninformed masses on Saipan. It’s also fair to ask whether the ugly local politics surrounding the memorial initiative — overwhelmingly against it from the beginning — exerted an insidious influence on the tone, content and efficacy of the KSPN2 News report. On the other hand, some credit is indeed due to KSPN2 News, as Saipan’s Destination Channel is the only TV news station in the world that has produced two important stories recently about Amelia Earhart, Marie Castro and the proposed Earhart Memorial Monument (see “Saipan TV News supports Earhart monument“), while not a single American media outlet has breathed a word of it. Thus, the U.S. establishment’s total and absolute hatred for the truth in the Earhart disappearance remains stronger than ever, and the 81-year travesty shows no signs of abating. Thank you for your amazing grace which is enabling Mrs. Josephine Blanco Akiyama, the last living person to witness the presence of Amelia Earhart and Fred Noonan here on Saipan in 1937 to be with us here tonight with the Amelia Earhart Memorial Monument group. 81 years is a long, definitely overdue, time for Amelia Earhart and Fred Noonan to be given the recognition they deserve as human beings who unfortunately met their death on Saipan soil. Tonight, as we acknowledge their presence here on our island, we ask that you guide our efforts to honor the memory of these two great American aviators with a memorial to be built in their honor. This is our prayer, in Jesus’ name. Amen.